After receiving a record number of entries, the judges of this year’s Toyota Dream Car Art Contest completed the difficult task of choosing the nine Canadian winners. 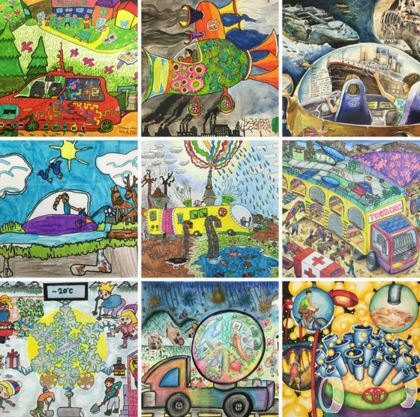 Last fall, Canadians were asked to invite youth ages 15 and under to envision their “dream car” – and the entries inspired a wide range of storytelling. Artworks were judged on originality, creativity and relevance to the “dream car” theme, and three winners were selected in each of the three age categories: under 8, 8 to 11, and 12-15. The nine winning entries will now have the opportunity to represent Canada in the world contest for a chance to be chosen among 30 global finalists. If chosen, each global finalist (and his/her parent(s)/guardian(s)) will be invited to travel to Japan on an all-expenses paid trip to attend a special awards ceremony this August. In the last three years, three Canadian entries were chosen as global finalists. Last year, more than 660,000 entries were received from 75 countries. Commenting on being a judge, esteemed lifestyle, arts and culture writer Sonya Davidson noted how uplifting the experience was. “I was deeply touched by these young artists and their drawings – some by their ideas, some by their artistic talents and some by the messages they chose to send. Wow, so much talent! Just knowing that these children will grow up to be tomorrow’s adults fills me with love and hope. Bravo to all the participants,” said Jaime Damak, leading family blogger and founder of Je suis une maman.